You'll be £8.00 closer to your next £10.00 credit when you purchase One of Churchill’s Own. What's this? John Greenwood was born in East London on 3 April 1921. At the age of eighteen, in February 1939, he forged his father’s signature and joined the RAF on a short service commission. Seven months later, Britain declared war on Germany and 253 Squadron was formed. In May 1940, John and his fellow pilots were sent to France with 24 hours’ notice where he shot down a Dornier 17 and a Messerschmitt 109 the next day, before returning to England with only four pilots and three aircraft left. 253 Squadron was then sent to Kirton in Lindsay to reform, having lost half the Squadron in France including the CO and both Flight Commanders. At the end of August 1940, the Squadron flew down to Kenley to join the Battle of Britain. The next day he shot down a Heinkel III and was subsequently credited with ½ a Junkers 88 and a Messerschmitt 109. Despite being credited with 5 and half victories in France and The Battle of Britain, he was, controversially, one of the few aces never to be awarded a DFC. Although he emigrated to Australia in the 1950s, he returned to London for the 25th, 50th and 60th Battle of Britain Anniversaries, then again in 2005 for the unveiling of the Battle of Britain monument, before passing away in 2014. He was the last surviving member of 253 Squadron. One of Churchill’s last surviving Few, this is his story. 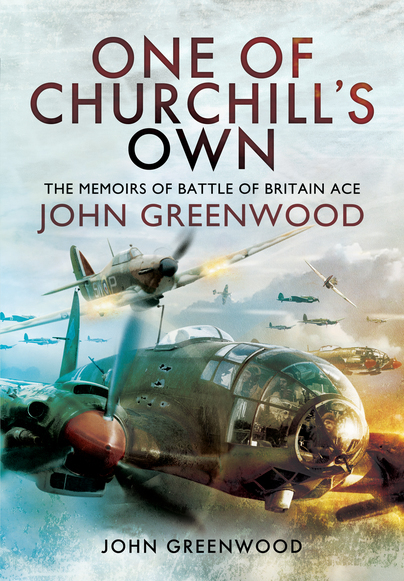 John Greenwood (1921-2014) joined the Royal Air Force in 1939. He served throughout the Second World War, seeing active service during both the Battle of France and the Battle of Britain. He was credited with five and a half victories over the course of these two battles. This is an impressive tally, by anyone's measure, yet he was one of the few aces never to receive a DFC. This autobiography, published for the first time by Pen and Sword Books, has been released with the full backing of the late author's family. It is hoped that its release will shine a light on an overlooked ace, affording him the recognition he deserves.